Magnolia ISD is providing another way for District stakeholders to access District and school information in a user friendly and convenient way. 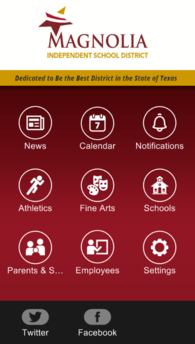 You can also search "Magnolia ISD"
Once you selected the campuses you want to follow, the News feed and Calendar feeds will provide you with information from those campuses and the District. You will also received push notifications from the District and campuses you selected.